06:45 pick up from your hotel lobby. Depart Bangkok in our private VIP A/C Mini van. 08:00 AM Mae Klong Railway Market. Folding umbrella Market / Train market. See the locals trading on the active train track. around 08:30 am train will arrive at the station so we can see busy railway market at the authentic moment. 09.00 Damnoen Saduak Floating Market. This buzzing market is at its best in the early morning before the crowds arrive and the heat of the day builds up. Explore the market in your own private paddle boat (paddle boat pilot included). 10:00 Use a paddle boat to experience the floating market and surrounding picturesque areas. 13.15pm Drop off at the hotel or any place you require. A. Riding the elephant program/20-30minutes.THB600.-/person/20minutes. B. Bathing the elephant program/20-30minutes.THB1,000.-/person/20minutes. Take your own private paddle boat through the market. -Entrance tickets , paddle boat trip. - Overtime tour guide and private van if tour runs significantly longer than stated times @ 550THB per hour per group. - food / snacks / drinks. (typical per person costs approximately 80-150THB while touring the market. 07:30 pick up from your hotel lobby. Depart Bangkok in our private VIP A/C Mini van. 10.30AM Visit the Donrak war cemetery, Maintained by the commonwealth war grave commission. 11.00AM War Museum and The Jeath museum, Giving an insight into the daily grind of prisoners working in jungle conditions under an unforgiving tropical sun. 12:30PM Lunch at local restaurant. 13.15PM Take a ride on the death railway. 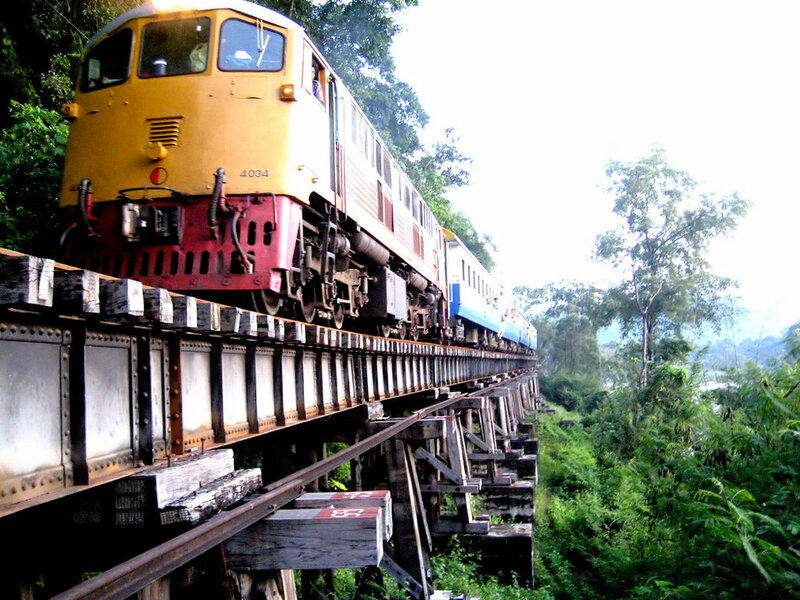 journey along the notorious Thailand–Burma Death Railway from Kanchanaburi to Nam Tok is one of Thailand’s most scenic and most popular train rides. Though the views are lovely, it’s the history that makes the ride so special. A picturesque wooden death railway bridge on the slope of a steep cliff. A walk on the train track allows you to enjoy a nice view over the Kwae Noi river. Close to the railway track is Krasae Cave at present it is a place of worship with a sitting Buddha statue inside. 15.00PM The bridge over the River kwai. Constructed by POWs labor though Thailand to Burma. Visit the eponymous bridge, Reconstructed after its bombardment by Allied forces. 18.00pm Drop off at the hotel or any place you require. B. Bathing the elephant program/20-30minutes.THB1000.-/person/20minutes. - Bathing the elephant program; please bring the swimsuit or spare clothes towel, soap. Bridge over the river Kwai. - Overtime tour guide and private van after 13 hours tour costs 550THB per hour per group. Information for private tours dress code, transport and weather. - This is package tour : If your tour would not completed all those places on the itinerary, still the same charged. -The deposit is 2500THB per group. The deposit is non-refundable.